I am working at the information desk on the fifth floor of Halifax Central Library; it is hot and sunny outside and the rest of my family is off having a lovely day at the beach. It's nice and cool where I am and I certainly love hanging out on the the fifth floor, but I'd be lying if I told you that I wouldn't rather be stretched out on the the sand right now, reading something good. When I'm on holiday I enjoy browsing short stories, essays, and humorous memoirs -stuff that I can read in spurts without committing too much of my attention to it. There are a few very attractive looking literary anthologies I always notice when looking for items to put on display at the library, so before my last trip to the beach I picked up one of them, The Best American Nonrequired Reading 2014 (BANR for short) and had a look through the poetry, short stories, non-fiction, and cartoons contained within. My attention was immediately captured by a transcribed episode of the podcast "Cecil Speaks" entitled Street Cleaning Day, a comical radio newscast in the style of War of the Worlds which depicts the panic which breaks out in the fictional desert town of Night Vale when it is announced the street cleaners are coming. It's weird but good (and on a side note: I just discovered that the upcoming novel based on the podcast, Welcome to Night Vale , is available for requests in the library catalogue now). The next piece I read after I took BANR home with me had me laughing out loud: On the study of physics in preschool classrooms is Matthew Schultz's deadpan curriculum to introduce toddlers to quantum physics by doing all kinds of impossible activities with them including field trips to the the moon and growing a star in the preschool classrom (beware with this activity -if the star collapses into a black hole there is a risk of students being sucked into the vaccum). BANR is not all fun and laughter; I jumped ahead to Janine di Giovanni's Seven days in Syria and was immersed in grim account of the war correspondant's experiences there as the fabric of the country unravelled around her. The Best American Nonrequired Reading selections are chosen by two groups of high school students located in Califronia and Michigan, in collaboration with the editor (until 2013 this was Dave Eggers, but in 2014 the journal was edited by Daniel Handler, a.k.a. Lemony Snicket). The result is a collection of funny, profound, and thought provoking works of quality writing that will keep you engaged through your entire beach visit. The library catalogue carries back issues of BANR dating to 2002. Check out the other Best American titles for anthologies in various genres including: comics, noir, science fiction, and more. 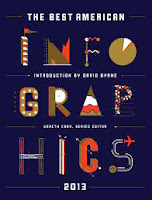 Next on my list is the very cool looking: Best American Infographics. See you at the beach!